Athletes are passionate—about their bodies, their sport, their team. That passion drives them to live fun, healthy, and active lives, which is great! Unfortunately, the hard pounding, twists, turns, kicks, and landings can lead to injury, too. Fortunately, the Absolute Foot Care Specialists in Las Vegas offer a variety of advanced treatment methods designed to get athletes back in the game as quickly as possible. 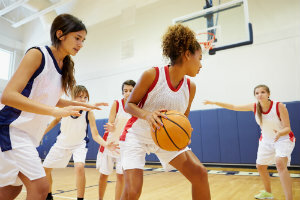 Sports injuries can affect any system of type of tissue, from muscle strains and ligaments sprains to broken bones, pinched nerves, or torn tendons. That said, you can sort almost any injury into one of two categories: traumatic (which are your over-in-an-instant snaps and tears) or overuse (which are aches and pains that build over time). For minor aches and pains, a little old fashioned athletic foot care at home can make the difference, including resting, changing up your training routine, and picking up new gear. However, tougher pain that gets in the way of your daily life must be evaluated and treated by a professional. No two injuries are exactly alike—not even two ankle sprains, or two tendon ruptures. At Absolute Foot Care Specialists, we always put the needs of the patient first. We take the necessary time to listen to your concerns, answer your questions, learn about what it is that drives you—and then recommend a treatment plan optimized to fit your condition and your needs. We are proud to offer EPAT / shockwave therapy to our sports injury patients. This is the premier treatment for athletes who don’t have time to slow down. EPAT uses externally generated pulses of mechanical energy to stimulate cellular metabolic and vascular activity at the site of injury. This can dramatically reduce the normal recovery window from an injury, or bring long-awaited healing for chronic problems that haven’t responded to other treatments. Other potential treatments may include custom orthotics, physical therapy, immobilization, or surgery. To schedule an appointment with the Absolute Foot Care Specialists, please connect with us online or give our office a call at (702) 839-2010.